A film by Susan Cohn Rockefeller featuring Nell Bryden and her band. Striking a Chord shows the behind the scenes of an American "hometown" band that is recruited to play overseas for American troops. This film pairs the journey of Nell Bryden and her band with interviews of the troops treated to a performance. What makes these music performances a little different than the familiar USO tours is that musicians are "recruited" directly through the armed forces. This gives a chance for lesser known talented musicians to play live music and bring local entertainment overseas. These music tours can last around 10 days and the musicians work with the armed services but they themselves are not military personal. "Striking a Chord" attempts to juxtapose the musical experience of the very talented Nell Bryden band with an increased awareness of troops suffering from PTSD. An overall theme of "music can heal" is achieved with additional interviews by trained PTSD experts along with Lt. Col. Scott Rainey former chief of Armed Forces Entertainment. IndependentFilm.com spoke with Susan Cohn Rockefeller while she was attending the Hampton's International Film Festival with her film. One of the hardest things to do, before any shooting begins, is to request access to a story and the participants. How did you get access to this story? My son plays drums. His drum teacher had gone over before with the armed forces through the Department of Defense. The USO is the more well known organization that brings over famous A-list celebrities. The Armed Forces actually has their own division which sponsors second tier performers at the B and C level. So this teacher said to me 'I went to Iraq and my life was changed'. He said, 'We are going back again and would I (Susan) like to make a documentary film about the trip?'. He's in his early 20's. When he met and performed for the soldiers it changed his view of the military and of the war. Not in a political way, on a personal level. So I said look, here is this musician Nell Bryden and I really liked her music. She is a huge talent. There could be a story here. Did you get to go as well? For the first time I was not able to go. So I had a very short time of a few days to find a cameraman. I found a cameraman from LA who had been to Iraq before. I made some calls and found some people who were able to go. This was an 8 day shoot. With travel it was 11 days. Who is responsible for this program? Lt. Col. Scott Rainey is responsible for the recruiting musicians. It was perfect timing. They send over about 200 bands a year. And he even visited South by Southwest to discover bands. What's great about the program is it sends aspiring musicians. 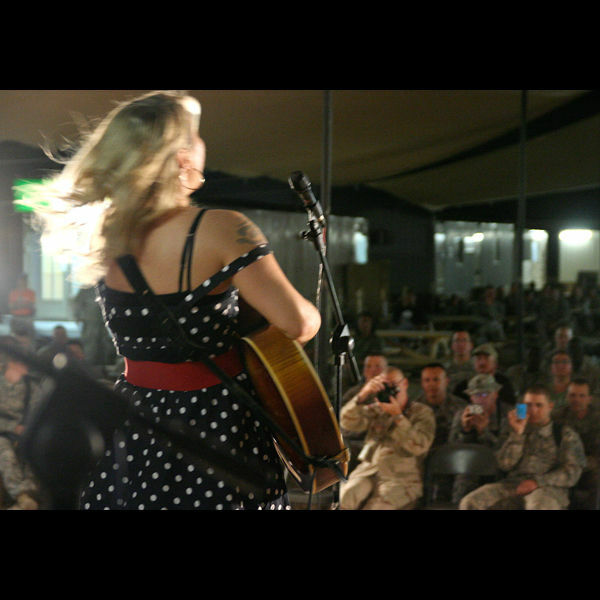 Shows are put on and you can go over and play live music and give the troops a slice of home. 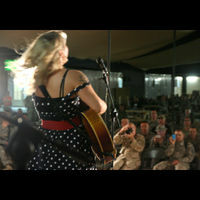 And the troops can see the kinds of bands they may see live in their hometown. Were there many restrictions to shooting your documentary about the military? We were lucky. You never really get to see the inside of military bases. It's just not allowed. The soldiers opened up and felt comfortable with us and talked mostly about their families back home. Who is your intended audience for this documentary? I hope that music schools will see our film and learn about this music recruitment program so that more musicians may want to apply to perform for our troops. And I encourage people to visit the armed forces website and submit their CD. I did sound for the band "Catchpenny" in 2008. Iraq, Kuwait, Dubai,Abu Dhabi. I was their HS band director! Col. Rainey was our guy in Iraq. Terrific! Met such great "kids" and saw so much cool stuff. 2 Osprey flights, Chinook, C-130, demos, etc. THe band has been back 9 times and sent other bands, BMX bikers, etc. I still keep in touch with some of the troops I met . An awesome experience! Norm, that's awesome. I really enjoyed watching Susan's documentary. It really gave me insight into a program that I otherwise would have never known existed. Norm, thanks for sharing your comments. We'd love to hear more about your experience and include it on the strikingachordthemovie.com website! You can email us at info@strikingachordthemovie.com. Corey, we're so glad you enjoyed the film. Spread the word!